Plantain is an ancient plant original to Europe but now widely distributed throughout most of the world. Although the herb has a very long history of use, many people consider it a nuisance plant when it shows up in their carefully manicured lawns. In fact, plantain is so prolific and persistent in spread that it’s referred to as a cosmopolitan weed, meaning it’s often found growing in roadside gravel or jutting out between rocks. 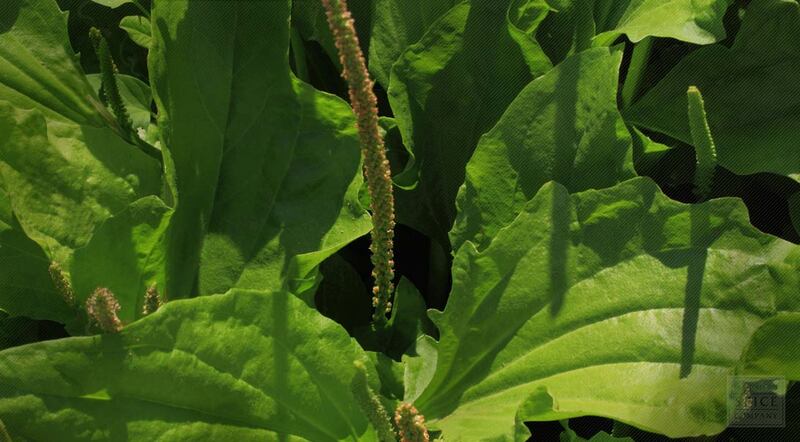 While fresh plantain leaf is consumed as a bitter salad herb, the dried leaf is used to produce teas, tonics and infusions. Due to the presence of an astringent compound called aucubin, plantain is also used to make poultices as well as infused oils and tinctures for topical use. Plantago major is an herbaceous perennial plant of the Plantaginaceae family with a rosette of leaves 15–30 cm in diameter. Each leaf is oval-shaped, 5–20 cm long and 4–9 cm broad; it rarely reaches up to 30 cm long and 17 cm broad. The leaves have an acute apex and a smooth margin; there are five to nine conspicuous veins. The plantain's flowers are small, greenish-brown with purple stamens and are clustered in a dense spike 5–15 cm long on top of a stem averaging 13–15 cm tall (rarely to 70 cm tall). Plantain is wind-pollinated and the plant propagates primarily by seed. These seeds grow on long, narrow spikes which rise well above the foliage. Each plant can produce up to 20,000 of its very small, oval-shaped, and bitter seeds. 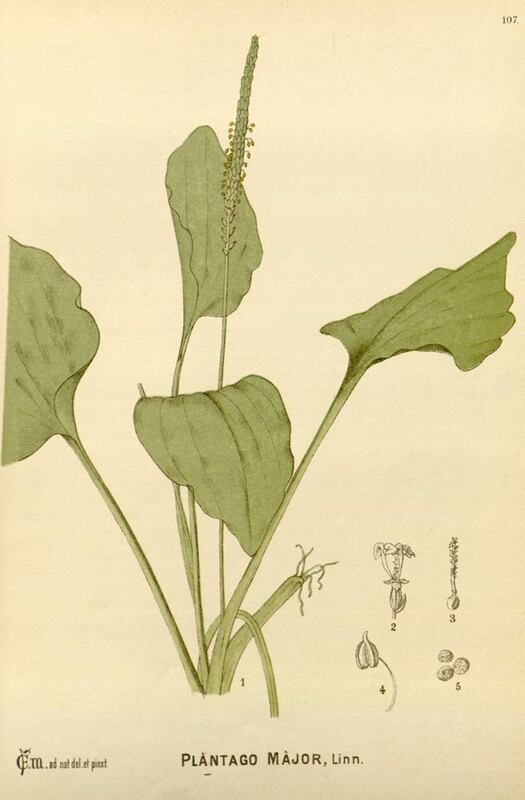 Puritan colonizers reportedly brought plantain to the Americas where it thrived in the disturbed and damaged ecosystems surrounding European settlements. As such it was known among some Native American peoples by the common name "white man's footprint". Plantain is native to most of Europe and northern and central Asia, but has widely naturalized in other parts of the world. Plantain grows in lawns and fields, along roadsides, and enjoys other sunny areas that have been disturbed by humans. Plantain does particularly well in compacted or disturbed soils. Sow seeds in spring in a cold frame. When they are large enough to handle, transplant the seedlings out into individual pots and plant them out in early summer. A sowing can be made outdoors directly into the garden in mid to late spring. Plantain leaves are harvested when young and tender. Store cut or powdered plantain leaves in an airtight container in a cool, dry place.